You are here: Home / 2016 / September / Particle Fleet Launched! 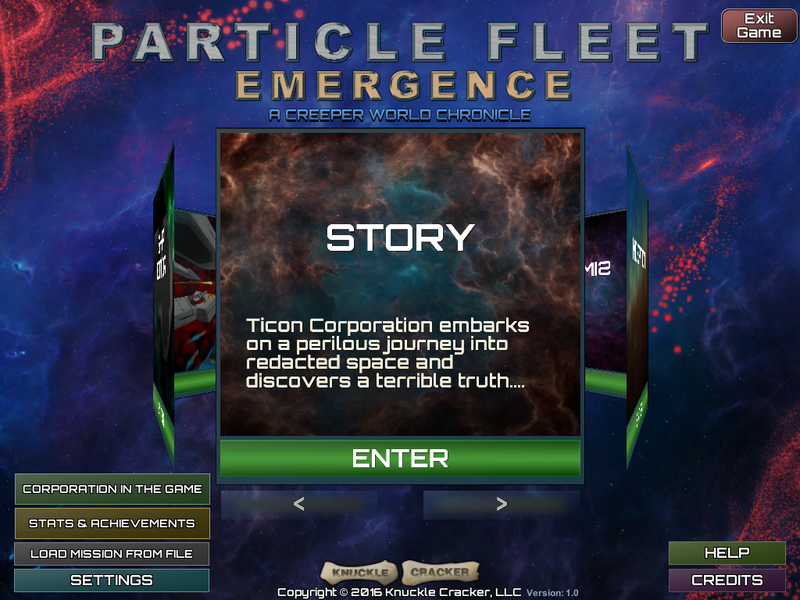 Particle Fleet is now available on steam and for direct purchase! Creeper World 3 was released on Oct 4, 2013. Creeper World 3 was released to steam on Mar 27, 2014. The first ‘toy test’ for what would become Particle Fleet was on May 20, 2014. The last toy test was Jun 30, 2014. The game project began on that day. Is there any difference for you what way do we use for purchase? Steam takes some percentage of the money. Buying it through the website should earn him a little more. On the other hand, large sales on Steam means Steam will advertise the game more which means more people will buy it. Please tell me, if I buy the game via fastspring.com, will you get more revenue then buying via steam? Shut up and take my energy! Congratulations Virgil. It must feel like another child has been born! Your dedication is inspirational. I am proud to be one of the first ones to buy it! I have absolutely loved your previous game and I can’t wait to waste countless hours on this one! I forgot to check this stream for the past 2 months, with some summer camping and the beginning of school. Now, today, of all days i check and it is up. What are the odds. Really? One day after the demo! Best…Day…Ever!!!!! Thanks for all the hard work – Demo was awesome, and I suspect this will eat many hours! Congrats on releasing another great game! Congratulations Virgil. Another great game. Going to buy a few guest keys for friends. I played the demo. It’s even more fun than I imagined. Will be buying it as soon as I can. I must confess, for years I’ve been enjoying your games but unfortunately, I could never afford paying for them so I pirated them, this time I’m finally purchasing a copy to support future development of such games, even if it means I have to tighten the belt for a few days I can’t continue enjoying your content without giving back, it’s the least I could do. Congratulations for yet another awesome entry in the Knuckle Cracker franchise. In the beginning, I did too, not gonna lie. HOWEVER! I eventually went and bought the bundle of CW1 and CW2, and later bought CW3 on Steam. I don’t see any harm in pirating to “try before you buy”, so long as YOU ACTUALLY BUY the games you pirate. I have a rule, two to three story missions, and you either find the game and buy it, or delete it. That’s my rule and I’ve never deviated. Of course, all this is a moot point, since I bought PF LITERALLY the instant it went up. (Side note: Pretty sure I was your first sale on steam.) But for other games, I find this is a good way to get a “demo” when the demo era died with the birth of Steam, Virgil being a GREAT exception. Congrats on the release. Now what can we do to support the release more! While its an understandable reply, you’d have a much easier time finding things you can both play and like if you accept that not everyone is going to translate their game into many languages. It would help if you told him what language you were looking for. Congrats, Virgil! Hope it is selling great! Jumped on it as soon as I saw it on steam, gotta say its a straight evolution of the Creeper series mechanisms, my god everything, the music, the system thats makes everything more mobile, enemies being particles rather than liquid ish, I will write up a review on Steam as soon as I’m done with story mode. ….May be when I’m done with some of the additional stuff. Please keep up the great work! You still have “Coming Soon” bundle for PF on your home page. Time to update? Your browser has it cached…. don’t know why but I noticed a similar thing in chrome on one desktop. If you force refresh the page it will reload and get the new graphic. I guess I could change the image name and that would do it for sure. Bought it loved it, can’t wait to see more from the creeper world series so when can i pay you for the 5th game? Well good news is I have a half dozen things to research on that very topic and at least a few of them have me pretty intrigued. We will see what happens in 2017. But for now, there are some interesting things I’m adding to Particle Fleet that will keep me pretty busy through the end of the year. Some sort of vacation or mico-vacation seems to be in order for you as I am fairly certain the 80:20 rule applied in the last couple months for you to get here (80% of dev. time is in the last 20%). Congratulations and kudo’s on the excellent craftsmanship with PF. It’s probably not on the top of your priorities list, but it would be VERY nice if you could update the “Unit Capabilities” item on the KnuckleCracker wiki so we can see exactly what the modules’ stats are — I’m particularly curious about energy storage and reactor output, but seeing stats on all modules would be ideal. Mister_Andy. You might check the forums for answers to your questions. There is currently a sticky in Gameplay discussions about your questions. To summarize, Command Module holds 50 energy, Tank holds 500, and Guppy holds 100. Reactor generates 1.5/sec.